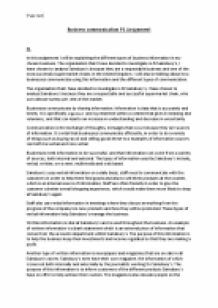 ﻿[Type text] Business communication P1 Assignment P1 In this assignment I will be explaining the different types of business information in my chosen business. The organisation that I have decided to investigate is JS Sainsbury?s, I have chosen to analyse Sainsbury?s because they are a respectable business and one of the most successful supermarket chains in the United Kingdom. I will also be talking about how businesses communicate using this information and the different types of communication. The organisation that I have decided to investigate is JS Sainsbury?s, I have chosen to analyse Sainsbury?s because they are a respectable and successful supermarket chain, who own almost twenty per cent of the market. Businesses communicate by sharing information. Information is data that is accurately and timely. It is specifically organized and is presented within a context that gives it meaning and relevance, and that can lead to an increase in understanding and decrease in uncertainty. Communication is the exchange of thoughts, messages that occur because they are sources of information. ...read more. Written information is vital at Sainsbury?s and is used throughout the business. An example of written information is a bank statement which is an external piece of information that comes from the accounts department within Sainsbury?s. The purpose of this information is to help the business keep their investments and income regulated so that they are making a profit. Another type of written information is newspapers and magazines that are on sale in all Sainsbury?s stores. Sainsbury?s even have their own magazine, the information of which is sourced both internally and externally by the journalists working for Sainsbury?s. The purpose of this information is to inform customers of the different products Sainsbury?s have on offer to help achieve their custom. The magazines also educate people on the beneficial things that Sainsbury?s are doing for charities. Another source of written information is advertisement; this is an internal source of information that is headed by the marketing department. Here the best forms of advertisement for a product are devised in order to help sell a product to the public. ...read more. This is usually a type of verbal information as the customer is either speaking to customer services in person or on the phone but it can also be written information as a customer may write a letter or email. This source of information allows Sainsbury?s to improve its customer service as they can learn from mistakes and complaints which help them develop as a business. Having a good customer services department like Sainsbury?s also gives the business a better reputation which is vital in a competitive market. 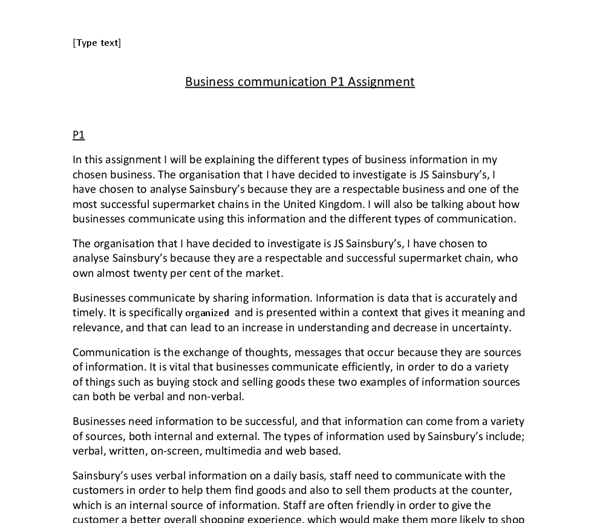 In this essay I have looked at the different types of business information and how they are used by Sainsbury?s. Business information is vital for Sainsbury?s as it is used in all levels and aspects of the business and it is needed to understand how a business is progressing. I have also looked at the different ways in which Sainsbury?s communicate whether it?s verbal or written information. Communication is again important in all aspects of the business but especially in the day to day for example Customer service staff have to deal with customers on the phone all day using verbal communication. ...read more. A good attempt at quite a difficult unit. The requirement is to explain the different types of methods of communication and while there could be more detail, reasonable understanding is shown. There are no examples of multimedia communication and this could have been considered more carefully. Telephone interviews are cost effective and are convenient for both parties. Another attribute of a telephone interview is the fact that a particular market can be directly contacted within a matter of minutes. Telephone interviews can also be recorded with the permission of the interviewee and can be thoroughly analysed at a later stage. 1.2 COMPETITOR ANALYSIS Key foreign players in Korea * Starbucks is currently the leader. About 100,000 people frequent 282 Starbucks outlets across 30 cities a day. Korea Starbucks has said it will be adding another 50 outlets during 2009. The Starbucks in Seoul's Myung-dong district is the largest Starbucks in the world--five stories, 5,750 sq, ft., and 190 seats. It is short and easy for people to read. It tells you everything in short detail. Tesco introduces its new products through it or if they have any new sales going on the show them up there. Web-based information: Web-based information displays many benefits of multimedia technology. Using today?s fats broadband connections, it is possible to stream sophisticated content to a computer anywhere in the world. The disadvantage of Tesco using E-mails is that some people don?t use their E-mail regularly and therefore won?t be able to respond to the message that has been sent to them on time. Another disadvantage to of using E-mails is that some customers will see Tesco messages and offers as a sort of spam which could be inconvenient sometime. The ripple effect is when in economic is in recession and creates an indirect effect that spreads out from the direct or main effect to reach businesses in areas. For example, People begin to cut down their spending when they are laid off and that has a ripple effect throughout the entire economy.